Run4Cover is America's best Dance Party Band for Special Event Entertainment at Weddings & Corporate Parties & Fundraisers! 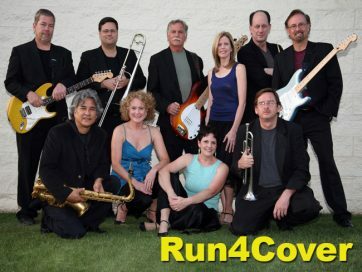 Hailing from Central California, Run4Cover is a 10-member band that has been delighting audiences throughout California for over 22 years and has opened in concert for a number of headliners including: Chicago, James Brown, the Temptations, and Huey Lewis and the News. Named as the Best Band in Central California, Run4Cover is currently accepting bookings throughout the United States. Run4Cover features 3 lovely and talented female vocalists, a blazing 3-piece Horn Section, and a very tight, 4-piece rhythm section which also includes 2 superb male vocalists. With 5 different lead singers in the band, there is incredible variety in every evening's entertainment. Run4Cover has Vocal Harmonies that are unmatched anywhere! And YES... they take requests! Run4Cover's horn section specializes in R&B, Soul, Funk, Motown, and Swing. Look to the rhythm section to add some Classic Rock, Contemporary Hits, and the deepest groove you can find on any dance floor. When you've got Run4Cover on the stage, you've got a serious party on your hands!